Interaction-wise MARCH is fairly bare-bones. 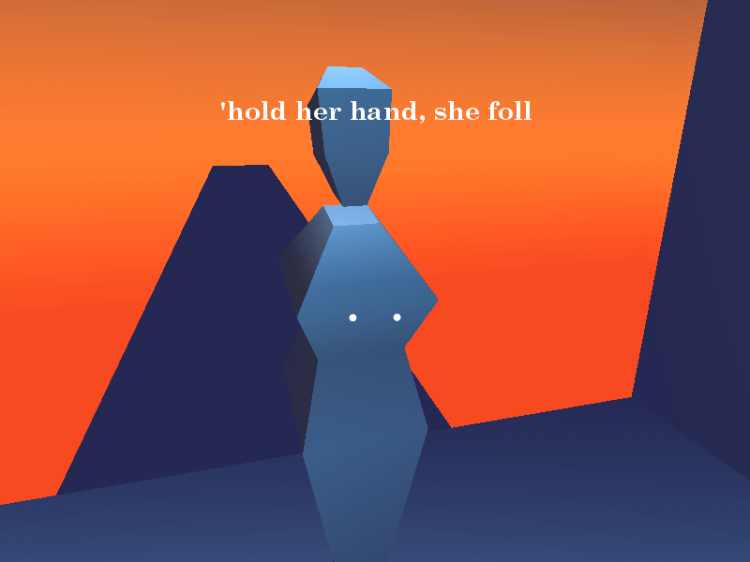 The player starts the game in a surreal, abstract environment that is difficult to see, and eventually comes across a feminine figure, which, when holding down the left mouse button near, will “hold your hand” and proceed to follow you. She serves as somewhat of a key to access further areas and otherwise cause things to happen, while also lighting the area around you so that you can navigate. However, movement is very restricted when holding her hand, and the player moves more slowly as well as loses the ability to jump, which are vital as the game plays out. Throughout the game, a frame narrative from an unidentified narrator appears at intervals throughout the game. This frame narrative isn’t identified as such, but it is basically recounting the real-life events that led to the making of MARCH. Very shallow, but it was the emotional core of the game, and the three things I wanted to depict most. There were, of course, a host of other things that I wanted to touch upon in the game, and in the end these three points only really had presence in the last third of the game. I would self-describe myself as a mediocre programmer, a novice level designer, and a completely naive modeler. These skillsets would be tested throughout the development of MARCH, which happened to need a lot of all three. MARCH was my second game made in Unity, and while the previous experience was helpful, I had to learn and relearn a lot about the program and libraries, which took up a lot of time. Level design also took quite a lot of time – while I think of myself as a game designer, I’m much more oriented towards thinking of narrative and systems rather than spaces, so this was a definitely a new challenge for me. Modeling was done all off the cuff, with as little effort spent on it as possible – the only things modeled in MARCH were the various engraved hand-hold icon tiles, “she”, and the figure at the end standing with her. 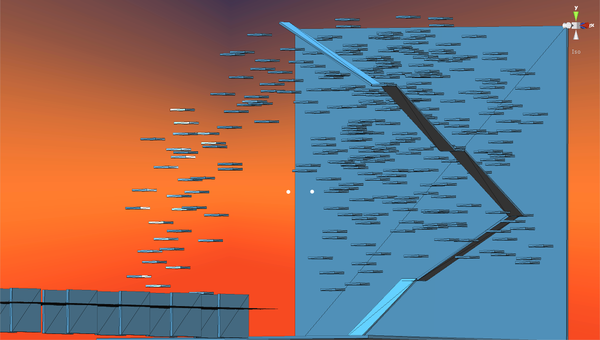 Everything else was composed of primitive planes and cubes, all created inside the Unity editor. While more imprecise than making the level assets in a modeling program (Unity editor’s sophistication stops at being able to snap vertices of a cube to the vertices of another cube), it saved me a lot of time because of how low the barrier to entry was. I could get into making levels in the editor pretty immediately. At the risk of using music people might have heard before, I used the works of composer Kevin MacLeod (incompetech.com), who supplies royalty free music as long as he gets credited. I would preferred Adam to compose music, but development was kind of haphazard to ask for any concrete tracks. In any case, the game was fairly straightforward to development, though I did spend two more weeks than it than planned. For all the emotional investment I had in the subject, there wasn’t much soul wrenching development (I credit this to my background in Creative Writing, a field where I routinely spill my guts out), and I steadily worked on the game until it was finally done. Level design: I received many comments to the tune of how well the level design worked out. Because the spaces are so abstract, it leaves a lot of room for expression, which I took full advantage of. The spaces are fairly loose metaphors for a number of things – the player’s mental state, the state of the relationship at the time, as well as to serve as ironic contrast to the narrative. As much as possible in this kind of minimal game, I wanted the spaces to tell the story alongside the actions and words in the game.This is keeping in mind how really, really linear MARCH is – it’s very much in line with the linearity of the narrative – there isn’t a whole lot to explore if you go off the beaten path, but despite that I’m very proud of how much I was able to do, even if it wasn’t a terrible amount. Narrative elements: Writing the narrative elements was the most mentally tasking part of the entire project. I felt like I possessed a lot of baggage when coming to this subject – it was a male-centered perspective, it was about a failed relationship, and the woman finds another man at the end. At the very worst, if someone were to come at MARCH blind, they could assume it was a biased sexist diatribe made in a moment of bitterness by a lonely soul. I wanted to avoid this tone as much as possible, because in my eyes, MARCH was as much about me explaining my motivations for breaking off the relationship as it was an apology for those actions. But I also didn’t want to create an overly sentimental game, because I felt like it would be insincere of me to put something like that forward. The thoughts and feelings in the actual event were complicated, subtle, and somewhat obviously, realistic, and I didn’t want to simplify and dilute them by making the writing correspond 1-to-1 to emotional states.From the very first line, “this is not a love story”, I staked my place, and I feel that the game adheres to everything I wanted that line to represent – somberness, reflection, emotional complexity, and atonement. The Moment: The particular lynchpin of the entire experience is when the player is forced to abandon her. I believe that the way the game is set up, almost all players form at least some sort of assumption that this character will accompany them everywhere, only to be met with a gutpunch as soon as they fail for the first time in the closing door area. Because the game’s events have already taken place (the narrative frame reveals as much), there is a tragedy in being unable to change the past. Despite the option of abandoning being abhorrent, it’s unchangeable – because it is the true version, it is the “right” course of events, and there is nothing that the player can do. As a moment of subversion, it worked incredibly well to throw players off and make them reevaluate the narrator, the actions of the game, and maybe even their own memories regarding a similar situation in their lives. Making the game personal: This went right in two ways. The first is basing it on a personal experience gave the game impact. Not only was I able to draw on my personal experience to make the game feel genuine and true (elements of authenticity are either deliberate or inevitably seep in, I feel), but the experience itself was something that I felt like people can relate to. Maybe not from the perspective of something ending a relationship with a significant other, but at least in the abstract sense of how complex relationships can become, or how confusing situations and emotions can become.Because of how personal it was, it had the added benefit of making me compelled to complete the game to my own level of satisfaction. I knew that if were to halfheartedly finish it, or be pressured to complete it without including everything I felt was needed in order to understand the entire event, then it would definitely end up as a weaker game, as opposed to maybe a leaner one. For me, it was enlightening to see how meaningful a game based on my own personal experiences can be, as well as how important it is to work until you yourself are personally satisfied with your work. While I probably won’t be basing all of my future games on my life’s experience nor be able to complete everything to my own personal satisfaction, I will definitely be keeping these two points close to my heart as I continue on my path of game development. Difficulty: MARCH suffers terribly from a lot of “cue” problems. Although not present in my original playtests, after I released the game I saw firsthand countless times people were getting lost, frustrated, or completely unable to think of what to do next. A number of things could be done in this regard: stronger, time based prompting where the game could bluntly tell the player what to do after nothing happens in a set amount of time, refining the level design further so that goals are more quickly realized, or maybe even implementing a skip button (it seems less ridiculous when considering the relative skill needed to be able to platform in a 3D space from a first person perspective – it is definitely a learned skillset that many, many non-frequent game players lack).I actually wanted MARCH to be semi-unclear in its goals and objectives – not because of design laziness, but as an earnest attempt to reinforce a feeling of confusion or obscurity. From a first-impressions perspective I actually like the level of obfuscation that MARCH has, but for a player who already might have trouble with the game, this level is too high for them to scale and finish the experience to completion, which I would prefer over maybe spoiling it a bit for a player who might not otherwise need help. MARCH remains a favorite of the games I’ve developed over my years as a game designer, and it’s helped me refine a lot of what I think about in terms of design and development. I’ve received some very touching messages from players, and that to me is what the mindful xp project was all about – getting confirmation, even minimally, from people experiencing meaning from our games, and learning from the games and from them. This entry was posted in Postmortems, Project 5c: MARCH. Bookmark the permalink.